Gunfighter. A dark denim blue with silver metallic shimmer. Halfway between a shimmer and a foil. Has a muted, faded denim look to it. Just like in the last collection, this reminds me of those old discontinued Maybelline denim polishes, so it makes me feel all nostalgic. Outlaw. This one is almost identical to Laced Corset from the other half of the collection. The tone is slightly cooler and it's a little more shimmery, but other than that there's not too much of a difference. I adore that red glitter. Posse. Really nice olive green shade. Has a very light gold, maybe more of a champagne colored shimmer that's very fine, almost fine enough to be a frost. Has a sort of dirty antique look to it. Rustler. 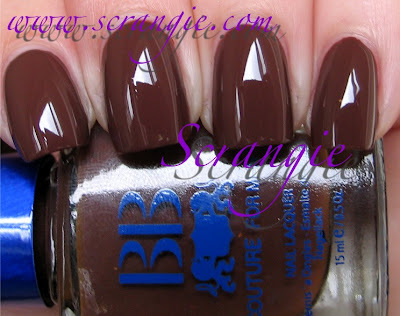 Warm earthy brown creme. Sundance. Bright! It's a red-orange shimmer, and the shimmer is so light and shiny that it makes the whole color glow. Very noticeable color. The formula on these was slightly thicker and more opaque than the colors in the ladies collection. None of the colors in this collection were watery, but Posse was thinner than the others. I did three coats of all. Dry time was good, wear time is good. Brushes were nice and even. So, overall, the entire Wild West Collection... I'm not really blown away with the color selection, to be honest. I like the Men's collection better than the Women's, but nothing besides Laced Corset / Outlaw really jumps out at me. The greens and blues are very nice, but they seem too close to other previous BB Couture shades so they don't feel new or different to me. The red glitter in Laced Corset and Outlaw is brilliant, though. It really looks spectacular and I'd totally recommend seeing it for yourself. Also, there's none of that pretty golden green BB Couture glitter in this collection! I always look forward to that glitter from them. It's like their signature, no one else seems to use that kind of glitter. I love your blog!!! Great nail polish colors! Posse is everything I wish ChG Peace on Earth was. I also like Gunfighter and Posse! Gun Fighter and Posse...mmmm. Lovely colors. :) I'm really curious about the missing polish. The one missing is Bandito. It's a black with light pink and purple shimmer or something like that. It kind of has a duochrome effect. It's very pretty. It's the only one from the men's line that I ordered, together with Outlaw. Else I got the Belle Starr and Pistol Packing Mama from the female's collection. I get what you said about these being similar to previous collections. It kind of reminded me of The Infamous Lovers somehow, even though the colors are completely different. Have you got a chance to review the Greek collection? I'm sure those unusual colors may look a bit more interesting to you? Now I want this whole collection D: I thought I could go with just ordering two. Where online can I buy this brand? Thank you! Difícil escolher uma cor só. Gostei de todas. São maravilhosas, e que brilho !!!!!!!!! I never heard of this brand. Count me as a dunce I get, but I live in a rural area and unless I hear about it from on line, it does not exist around me. I like this collection, esp Outlaw and Gunfighter. Love to see the color you were missing and the womens shades too. I need to look on line to see who/where this is sold. I like their men collection more than the women's half the time! Nice swatches! I really like Posse. Love BB Couture's greens. Now that's an Olive Green I could wear, it's more silvery than gold.